REVISED APRIL 27, 2018 ─ The Medical Association’s Take Back Alabama Week kicked off this week with a press conference at Walgreens in Birmingham on Monday, April 23. Representatives from AmerisourceBergen, Blue Cross and Blue Shield of Alabama, Pfizer, Prime Therapeutics and Walgreens joined Attorney General Steve Marshall and Birmingham physician Gregory Ayers to announce the installation of 13 new safe medication disposal kiosks in select Walgreens locations in Alabama. The kiosks allow individuals to safely and conveniently dispose of unwanted, unused or expired medications, including controlled substances and over-the-counter medications at no cost. They are available during regular pharmacy hours. The week ended with Take Back Alabama’s parent program, Smart & Safe Alabama, exhibiting at the Annual Opioid Crisis in Alabama: From Silos to Solutions to further spread the word about the new medication disposal kiosks as well as raising awareness for prescription drug safety. APRIL 20, 2018 ─ According to the Alabama Department of Public Health, 749 Alabama residents died in 2016 due to drug overdose, which includes prescription drug overdose. This number is up from 726 in 2015…and this is why the Medical Association of the State of Alabama created Take Back Alabama Week. In an unprecedented partnership, the Medical Association reached out to Walgreens, Blue Cross Blue Shield of Alabama and Pfizer to form a strategic alliance for education about and safe disposal of prescription medications. 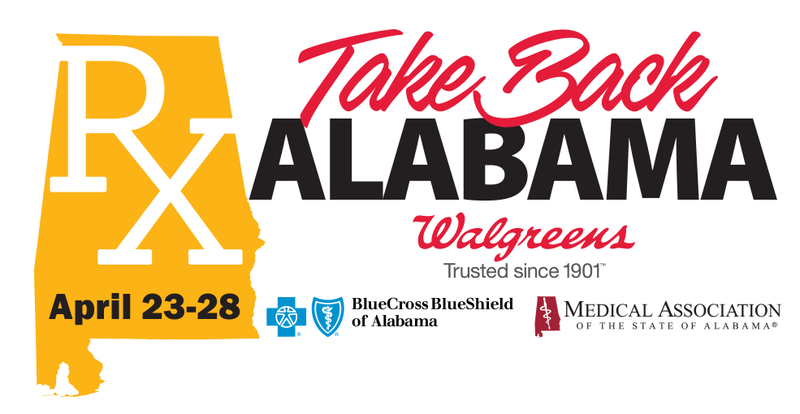 Take Back Alabama Week is April 23-28, and kicks off Monday, April 23, with a media event at Walgreens located at 4700 Highway 280 in Birmingham. The event is the perfect opportunity to spread the word about the availability of safe medication disposal kiosks in 13 Walgreens locations across Alabama. Attorney General Steve Marshall and Birmingham physician Gregory Ayers will join representatives from Blue Cross and Blue Shield of Alabama and Pfizer to kick off the campaign. Walgreens at these locations have drop boxes in which residents may safely deposit unused prescriptions and over-the-counter medications…no questions asked. These boxes are locked, and there is no danger of your medications getting into the hands of someone who could accidentally overdose or misuse them.